We are located on the Los Angeles County Fairgrounds in Pomona, California. The collection is open during days the Los Angeles County Fair is open, during any of our open house weekends , or during one of our special events. Please see the Calendar for exact dates and times. 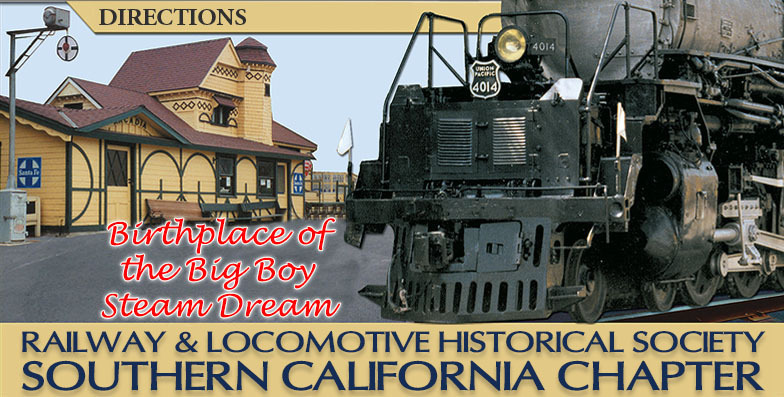 We will attempt to accommodate larger groups and railroad fans who are visiting from out of town, if you contact us a few weeks in advance to make special arrangements. However, we are an entirely volunteer organization and we will attempt our best to accommodate your schedule. Both admission to the train exhibit and parking are free, except during the County Fair each fall. By car, take the I-10 Freeway toward Pomona and exit on Fairplex Drive. Turn north on Fairplex Drive, go over the hill, and turn right on McKinley Avenue. After going down the hill, turn left into a parking lot marked as Gate #1. Enter the Fairgrounds at Gate 1, which has a guard station towards the left. Tell the security guard you are going to the historic train exhibit and they should be able to direct you to our exhibit. Below are detailed maps. Click on image for a larger, printable version. During the County Fair, several parking areas are open. Gate #17 parking is located at the end of Fairplex Drive at McKinley Avenue. When the County Fair is open, Metrolink stops many trains at the Fairgrounds. Please check their web site for details.